What is the cheapest way to get from Orlando Airport (MCO) to Orlando Science Center? The cheapest way to get from Orlando Airport (MCO) to Orlando Science Center is to drive which costs $1 - $3 and takes 22m. What is the fastest way to get from Orlando Airport (MCO) to Orlando Science Center? The quickest way to get from Orlando Airport (MCO) to Orlando Science Center is to taxi which costs $70 - $90 and takes 22m. Is there a direct bus between Orlando Airport (MCO) and Orlando Science Center? 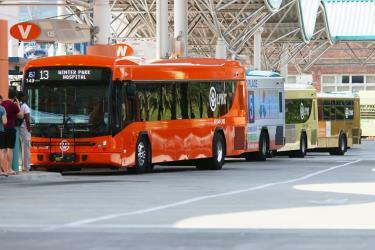 No, there is no direct bus from Orlando Airport (MCO) to Orlando Science Center. However, there are services departing from Oia Transfer Center and arriving at N Orange Avenue And E Smith Street via Lynx Central Station - Sunrail. The journey, including transfers, takes approximately 1h 5m. How far is it from Orlando Airport (MCO) to Orlando Science Center? The distance between Orlando Airport (MCO) and Orlando Science Center is 10 miles. The road distance is 16 miles. How do I travel from Orlando Airport (MCO) to Orlando Science Center without a car? The best way to get from Orlando Airport (MCO) to Orlando Science Center without a car is to line 11 bus which takes 1h 5m and costs $4. How long does it take to get from Orlando Airport (MCO) to Orlando Science Center? It takes approximately 1h 5m to get from Orlando Airport (MCO) to Orlando Science Center, including transfers. Where do I catch the Orlando Airport (MCO) to Orlando Science Center bus from? Orlando Airport (MCO) to Orlando Science Center bus services, operated by Lynx Central Florida Transport, depart from Oia Transfer Center station. 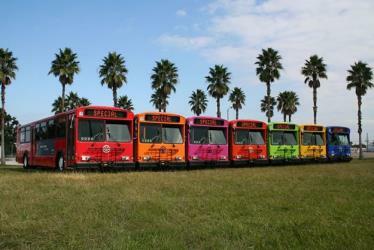 Where does the Orlando Airport (MCO) to Orlando Science Center bus arrive? Orlando Airport (MCO) to Orlando Science Center bus services, operated by Lynx Central Florida Transport, arrive at Lynx Central Station - Sunrail. Can I drive from Orlando Airport (MCO) to Orlando Science Center? Yes, the driving distance between Orlando Airport (MCO) to Orlando Science Center is 16 miles. 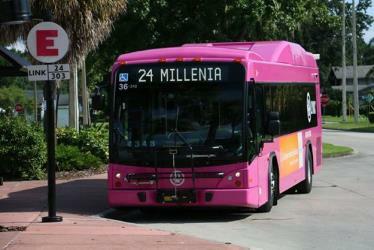 It takes approximately 22m to drive from Orlando Airport (MCO) to Orlando Science Center. Where can I stay near Orlando Science Center? There are 1113+ hotels available in Orlando Science Center. Prices start at $112 USD per night. What companies run services between Orlando Airport (MCO), USA and Orlando Science Center, FL, USA? 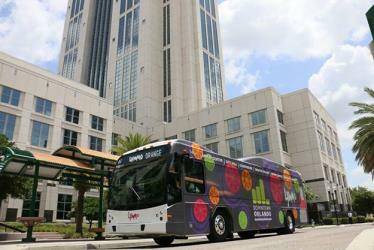 Lynx Central Florida Transport operates a bus from Orlando Airport (MCO) to Orlando Science Center every 30 minutes. Tickets cost $2 and the journey takes 42m. Rome2rio's Travel Guide series provide vital information for the global traveller. Read our range of informative guides on popular transport routes and companies - including Heading to Europe? Read this before you buy a Eurail Pass, French strikes 2018: What are my alternative transport options? and How to get from London to Edinburgh - to help you get the most out of your next trip. The Orlando Science Center (OSC) is a private science museum located in Orlando, Florida. Its purposes are to provide experience-based opportunities for learning about science and technology and to promote public understanding of science. Rollins College is a private, coeducational liberal arts college, founded in 1885 and located in Winter Park, Florida along the shores of Lake Virginia. Rollins is a member of the SACS, NASM, ACS, FDE, AAM, AACSB International, Council for Accreditation of Counseling, and Related Educational Programs. Rollins has about 30 undergraduate majors and several graduate programs. It was ranked #2 Regional Universities, South by U.S. News & World Report in 2017. Rollins College has ranked among the most beautiful U.S. college campuses by the Princeton Review for the past decade, ranking #1 in 2015 and #10 most recently in 2017. The Harry P. Leu Gardens are semi-tropical and tropical gardens in Orlando, Florida, United States. The gardens contain nearly 50 acre of landscaped grounds and lakes, with meandering trails shaded by 200-year-old oaks and forests of camellias. They are open to the public. The address is 1920 North Forest Avenue Orlando, FL 32803. Universal Studios Florida is a theme park located in Orlando, Florida. Opened on June 7, 1990, the park's theme is the entertainment industry, in particular movies and television. Universal Studios Florida inspires its guests to "ride the movies", and it features numerous attractions and live shows. The park is one component of the larger Universal Orlando Resort.
] Lake Eola Park is a public park located in Downtown Orlando, Florida. Lake Eola is the main feature of the park. Also located in the park (on the west side) is the Walt Disney Amphitheater, which hosts many community events and various performances year round. On the east side of the park is a Chinese pagoda, and a playground. The park is surrounded by four streets: East Robinson Street (State Road 526), Rosalind Avenue (SR 527), East Central Boulevard, and North Eola Drive. 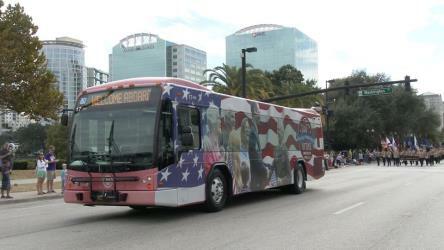 Rome2rio makes travelling from Orlando Airport (MCO) to Orlando Science Center easy. Rome2rio is a door-to-door travel information and booking engine, helping you get to and from any location in the world. Find all the transport options for your trip from Orlando Airport (MCO) to Orlando Science Center right here. Rome2rio displays up to date schedules, route maps, journey times and estimated fares from relevant transport operators, ensuring you can make an informed decision about which option will suit you best. Rome2rio also offers online bookings for selected operators, making reservations easy and straightforward.